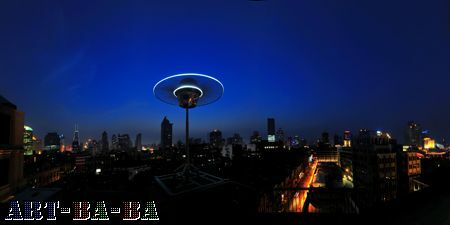 The Rockbund Art Museum in Shanghai uses its historical heritage and vision for the future to guide its exhibition planning, as an attempt to initiate a discussion on art-viewing and analysis, as well as a dialogue between society and culture in different temporal, spatial and cultural semantics. As the inaugural exhibition of the museum, Cai Guo-Qiang: Peasant Da Vincis exchanges the museum building’s past, as a collection of scientific curiosities, for contemporary art creations that illustrate in a historical cultural context the emergence of a grassroots force that came with the modernization of China. 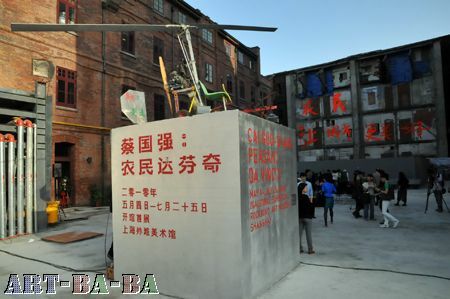 This exhibition is also Cai Guo-Qiang’s first collaboration as an independent artist with a private institution in China. The rich academic and humanistic content of the exhibition aptly expresses the founding ideals and the future direction of the museum. 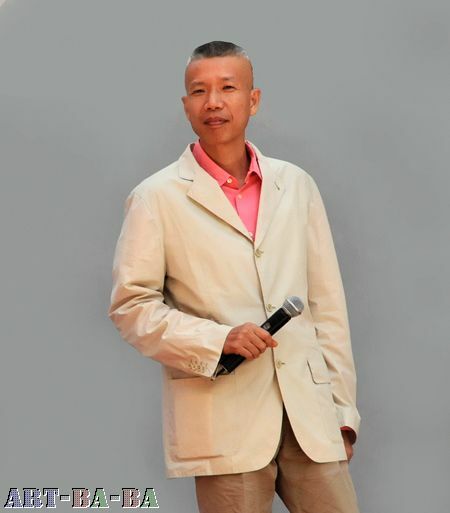 Throughout his career, Cai Guo-Qiang has been exploring themes such as the relationship between humans, nature and the universe. He never ceases to challenge the geographical, cultural and knowledge boundaries of our society, to express realities and mental landscapes outside of the world we are accustomed to. As the collector, curator and artist behind this exhibition, Cai uses multiple dimensions and perspectives to vividly express the modern-day Chinese peasants’ creativity, imaginativeness and perseverance in their pursuit. 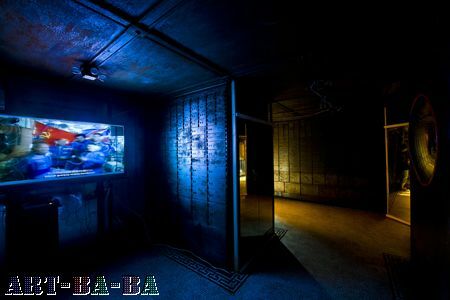 At the same time, the exhibition raises questions and hints at the deep skepticism against the rapid modernization and urbanization of China, along with the series of phenomena and trends in socio-economic and cultural development well exemplified by the World Expo, an emblem of globalization. It expresses the artist’s deep concerns towards society and its individuals as an independent intellectual. In the context of this era, Cai Guo-Qiang’s creations embody distinct academic and humanistic values. Not only do they enrich the diversity of contemporary art, they also project an alternative voice indispensable to a progressive era. 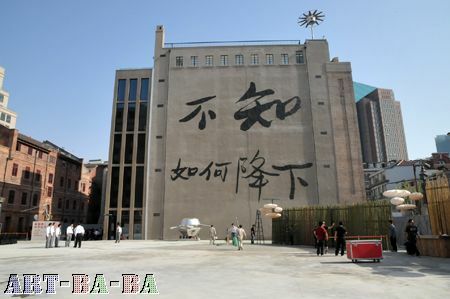 The newly opened Rockbund museum is composed of two buildings. "Don't know how to land"
Cai Guo-Qiang said that if this wall can always remain it will then become a piece of public art. 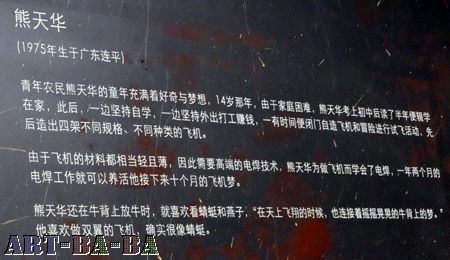 One of the wall of the old houses surrounding the museum has been purposely left as a reference to the past. 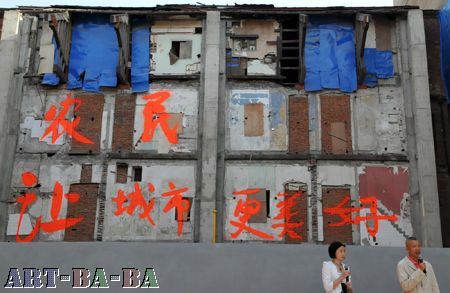 Cai Quo-Qiang wrote on it "Peasants make cities greater", an allusion to the World Expo slogan "Better City, Better Life". Outside of the museums a few works by peasants. 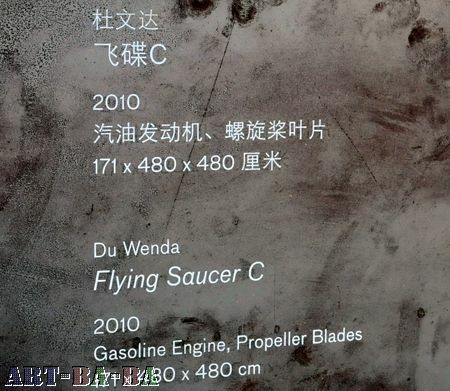 A helicopter by "Da Vinci" peasant Xu Bin. Each peasant explains their work. Below a plane by Xiong Tianhua. 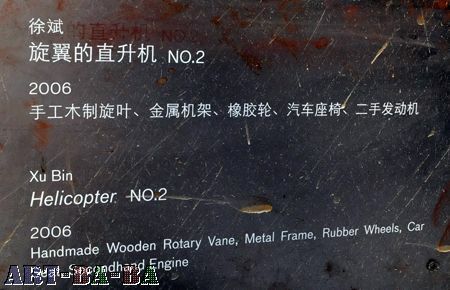 The plane flew for about 50 meters and was then broken. 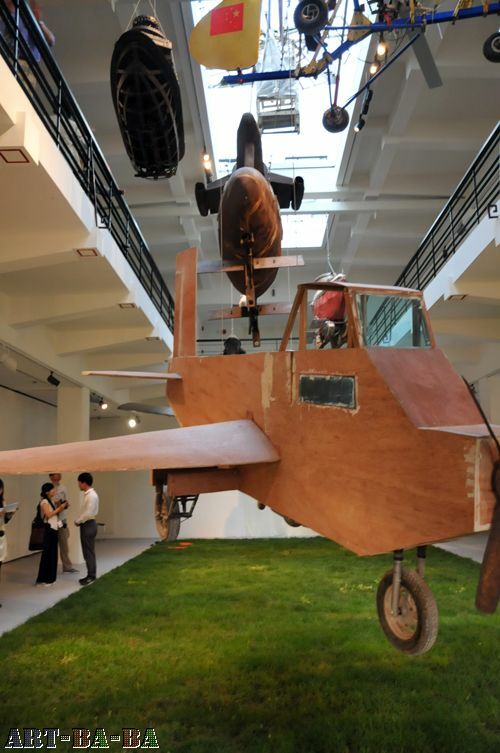 Xiong Tianhua wanted to exhibit a new one, but Cai Guo-Qiang prefered to present the broken one, adding in front of it the sentence "The most important isn't to fly" suggesting that the dream itself is actually enough. 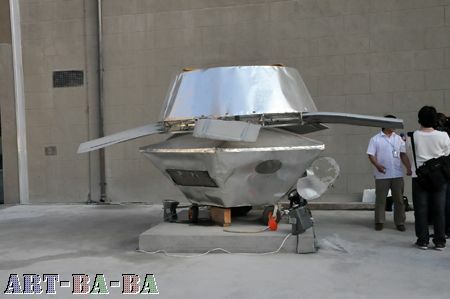 In the sky, on the roof of the museum is Du Wenda's flying saucer. 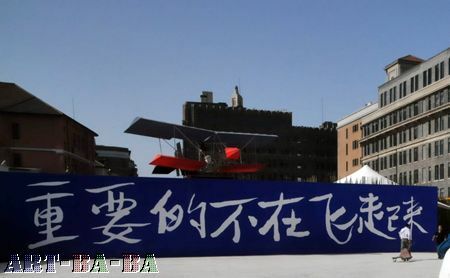 In the entrance of the museum, a broken plane has been hung....The author, Jia Chengnian, flew with it a few times, even taking his wife with him for her birthday. 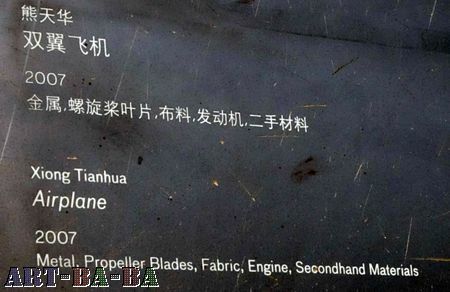 But one day, the plane crashed and Jia Chengnian died. 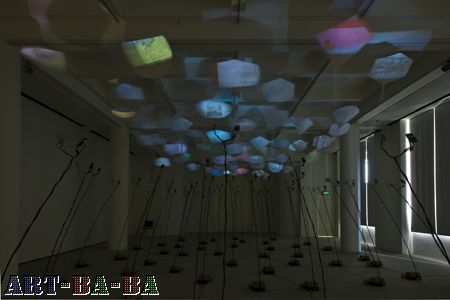 《Kite》 At the first floor of the museum a room is filled with flying white kites with a projection, each of them represents a peasant's dream. 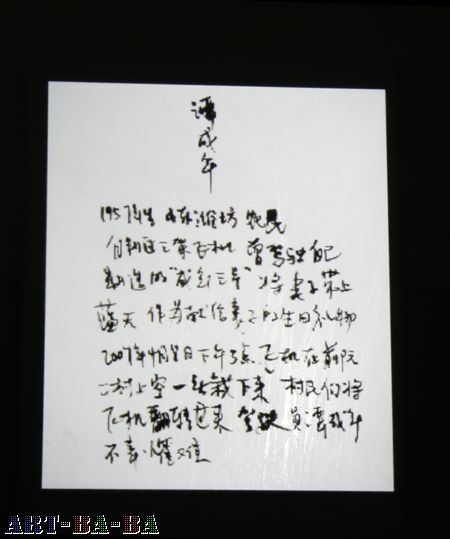 Cai Guo-qiang wrote that he could collect the names and the creations of peasants for the next 20 years. On the wall are written all the different names of Da Vinci peasants. 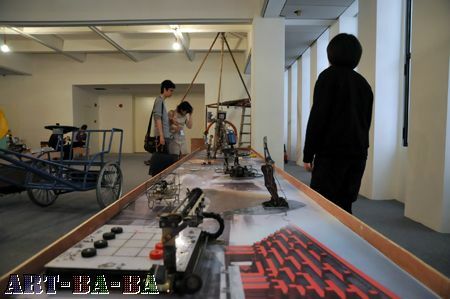 Mr and Mrs Wu Yulu and their children exhibited their works, all kind of robots, on the 2nd floor of the museums. Robots were on sell at the museum. "Fairy tale" a space filled with various creations by peasants such as helicopter, submarine, airplane, etc all hanging above a piece of grass. 60 birds have also been put into the room flying and singing. 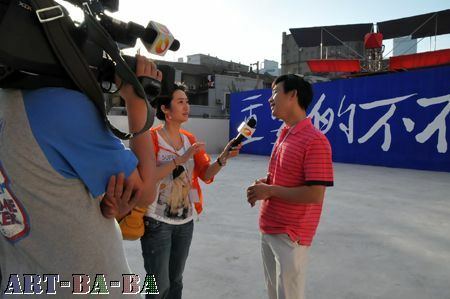 In the other buildling of the museum (previously a bank), An Wei built an aircraft carrier, called 2012 designed by Cai Guo-Qiang. 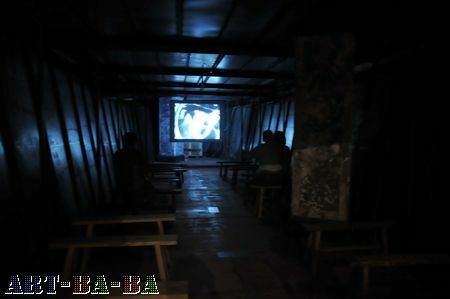 In the carrier a projection of a Sovietic documentary by Artavazd Peleshyan entitled "Our century". 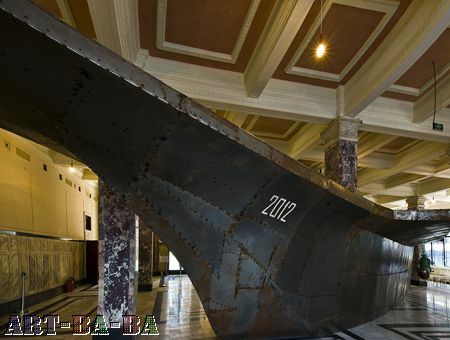 In another part of the building, a submarine of 6.5 meters long. In what used to be the vaults room of the bank, is presented a documentary film by Romanian director Andrei Ujica. According to Cai Quo-qiang both these two documentaries are somehow related to the energy of these peasants who try explore unknown worlds." 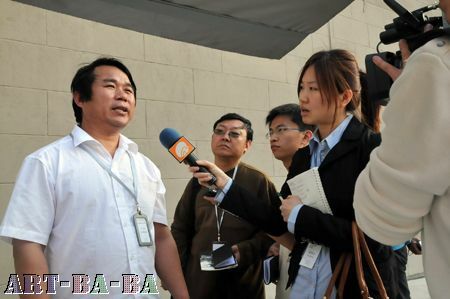 Although the works of the peasants were very interesting, this exhibition appeared very demagogic, presenting Cai Quo-Qiang has some heroes who organized a peasants' works exhibition in a museum. What is the artistic approach here? 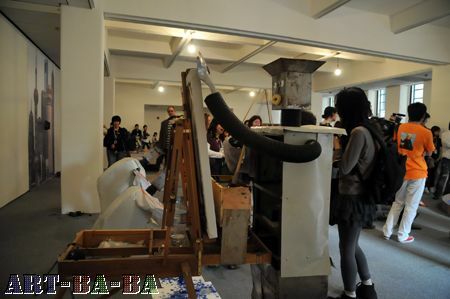 How can this be considered as a Cai Quo-Qiang exhibition?